The Union, by Terrance Guardipee, Blackfoot artist. Terrance paints in ledger style, using mixed media, on vintage ledger pages. This page is from a lumber and coal supplier, dated 1909. The painting shows a couple wrapped in one buffalo robe. 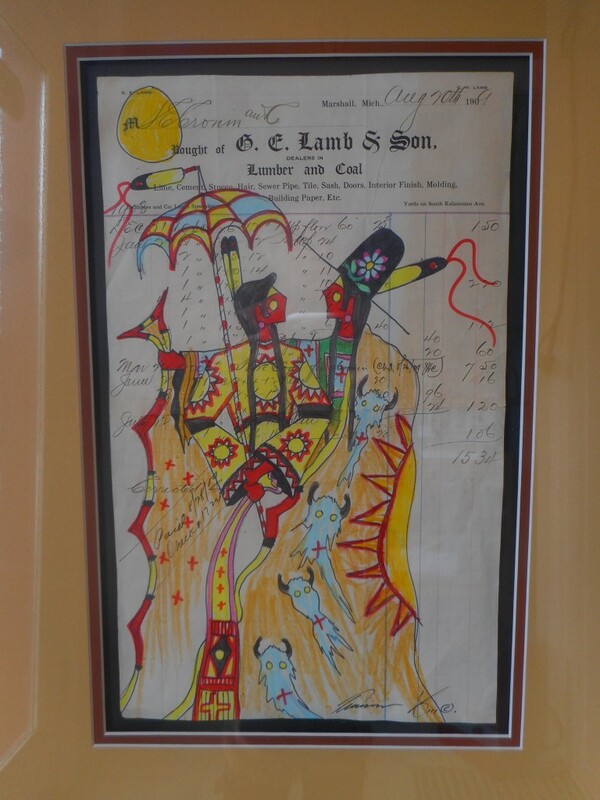 The robe has sun dance symbolism painted on it, with ghost dance buffalo heads and other elements. She is holding a sun shade, and her dress is decorated in bright depictions of the sun. Morning stars are visible throughout the piece. Noteworthy is the suitor's black open-crowned cowboy hat, beaded in a floral motif. This was a popular accessory among Blackfoot men on the reservations. 8.5"x 14". Framed 24" x 18".